My daughter and I had a nice time girl-bonding tonight. I’m not the type that gets into female bonding in general ( most of my platonic friends have always been male), but every once in a blue moon, I can get down with it. So we shared a bottle of chardonnay and got just a little goofy. She decided she wanted to give me a makeover and do my hair. I rarely have my hair done professionally; usually I do it myself, which means either a blunt, easy cut (if I’m ambitious) or a ho-hum parted down the center boring 1970s look. I did have my hair done by a real hairdresser back in March (you might remember that post), but it’s expensive, and my hair was getting boring and lifeless again (and worse, frizzes in the high humidity, so I told her to be my guest and have at it. She used a color called Soft Black Violet in the deepest layer of hair(near the scalp) and and after letting that sit about 20 minutes (rather than 40 like the box said–I didn’t want it BLACK because I remember about 20 years ago when I dyed my hair jet black and I looked exactly like Morticia from The Addams Family, with my pale, almost redhead type of skin crashing into the blue-black of my hair like a cargo of black and white linoleum floor tiles after a truck explosion. I asked her how much gray hair she could see (I have no gray where I can see it in the mirror). 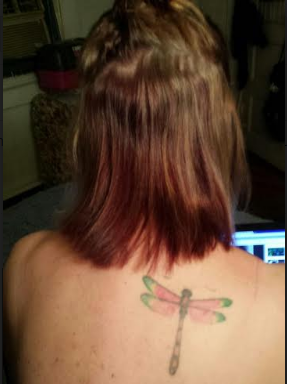 She told me just a little in the deep layer near my neckline in the back. “That’s it?” I marveled. One thing my family did right with me was give me good genes. I hate sounding narcissistic, but I always thought I looked pretty good. Most other people did too. Hardly anyone on either my mother’s or my father’s side looked anywhere near their real age (until age finally caught up with them, usually around 70 or 80). 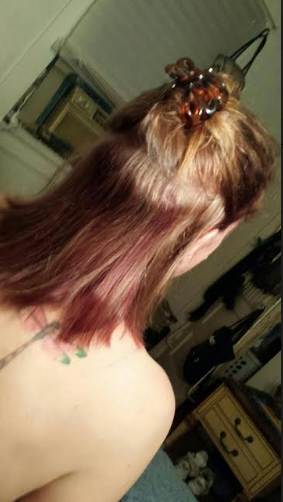 The result is a color a little deeper than strawberry blonde, but not really red either, sort of a dark mauve (the mauve must be from the “violet” in the haircolors’ name). My medium blonde hair on the top layer remained intact, and the effect makes my hair look thicker and with more 3-D depth. It will always grow out if you hate it. Here are the final results, after the blow dry and the hair straightening my daughter did. I think I just saved about $80.00. One last thing that made everything perfect. Here’s the song we cranked up and sang at full volume so it reverberated against the white ceramic tiles that cover most of the bathroom walls. It’s one of her favorite songs ever and it’s grown on me too. This entry was posted in family, fashion and beauty and tagged beauty, family, female bonding, haircoloring, hairstyling, having fun, mother-daughter bonding, simple pleasures by luckyotter. Bookmark the permalink. Hey that’s great. It’s very pretty and you saved so much. You should have more girl date nights like this. I am very surprised a soft black would turn out a cool red shade.. but as you said its the violet undertone that took.. and that’s awesome! im always trying to get the “cool” toned red shades only myself too. pinkish red violet goes perfect with your pale skin and light eyes! my friend is 50 and she just did the same thing! she is a pale redhead with blue eyes and she put pink/purple pieces in and I love it. That family time is so important, glad you got to have some! Your hair looks so good, wishing I had a daughti now. I’m glad you two had a great girls night at home. I got a lot of compliments today at work. 🙂 I’m glad I let her do it. I don’t know where you live, but here in Los Angeles a lot of much older women are embracing their gray hair and getting parts of it dyed in different colors – and I mean pretty wild colors. I hope it’s a trend that continues.